The Gray Report: Can a ginjo sake earn 100 points? 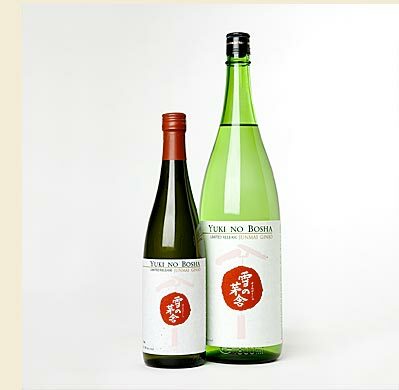 Can a ginjo sake earn 100 points? Though weary of debates about the 100-point scale, I discovered an interesting philosophical point after drinking about 60 sakes last week. For wine-review geeks, an ongoing debate about ratings of any kind is this: Should ratings be absolute, in which all wines are measured against all other wines? Or should they be relative, in which case the best Beaujolais -- or the best White Zinfandel -- in the world should get 100 points? It's an interesting debate to apply to sake because daiginjos are, literally, more refined than other sakes. So should the world's best nigori sake (the sake equivalent of White Zinfandel) rate 100 points, even if it's not as good as a good daiginjo? Joy of Sake is maddening because it's the only big sake-tasting event of the year in San Francisco, so whatever I choose to taste means ignoring everything else, possibly until next fall. * The crowd was all at the daiginjos. I like tasting without a crowd. Understand that ginjo sakes are not cheap or unrefined. At least 40% of the outside of the rice must be polished away, thus eliminating impurities -- but whenever you throw away 40% of the raw material, you're making a premium product. Daiginjo (literally, "big ginjo") must have 50% polished away. I'm not going to knock daiginjos; these are some of the best sakes in the world. But many times I like the ginjos better. So here are my favorites from 52 tasted, along with (the prefecture in parentheses), ratings on the absolute 100-point scale, and a few hastily scribbled tasting notes. And to answer my own question -- yes, I think a ginjo sake could earn 100 points, because I have had some that I thought were among the very best sakes I've ever had. But I just wasn't feeling that generous last week. A 100-point White Zinfandel, though, mmm, I don't think so. Though I'd like to see somebody prove me wrong. Tenju Junmai Ginjo (Akita) 93 Clementine, peach, lime and cream. Very wine-like; a great substitute for Riesling. Hamachidori "Ginginashikomi" Junmai Ginjo (Iwate) 93 Aromatic, with floral notes and white peach. Good acidity. Yuki no Bosha Yamahai Junmai (Akita) 91 Complex, intense, fruit and floral notes. Slightly hot on long finish.